Perhaps the most straightforward way to place a spread bet is to choose a company and then go long or short on the direction of its stock price. Spread Betting on individual shares has become tremendously popular in recent years. The choice of stocks available to spread bet via one of the main spread betting providers is absolutely huge and includes all UK plus main global and USA shares. This makes spread betting a good way to acquire exposure to overseas markets. Many of the prices on spread betting platforms are expressed in pence or points. 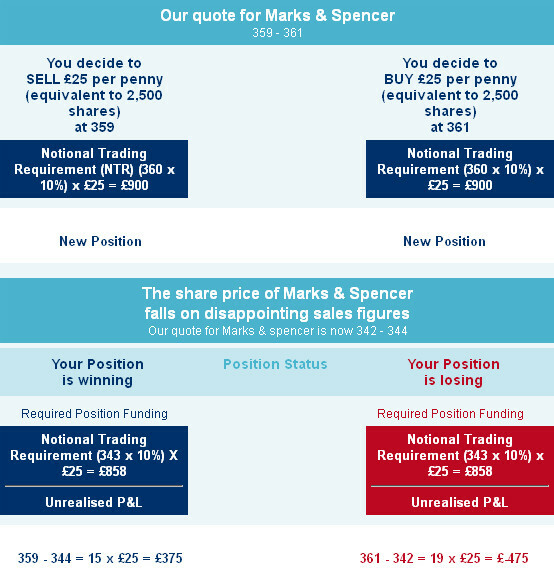 For trading shares £1 per point is the equivalent RISK of trading 100 shares. It is always 100 shares irrespective of price so your £1 can either buy you a miniscule position of real cheap shares or a huge position of expensive shares. For indices or forex trading, £1 per point buys the quoted price in pence but with a £ sign in front. Indices and forex have quoted prices in the thousands or tens of thousands so your £1 per point is buying a huge amount of Risk/Equity. Margin represents the minimum deposit required by your spread betting provider to permit you to open your position. It is normally expressed as a percentage of the total Risk / Equity of your position. As the price moves in the direction of your trade or against you, each point movement makes or loses you £1. It is worth noting that blue chip stocks commonly trade at a premium to other smaller companies, particularly during times of economic turmoil. Such companies tend to have more access to finance and their international presence helps them weather most storms, even those that hit us in 2007 and 2008 which wiped many smaller caps. There are so many advantages to spread betting shares it’s a wonder that anyone does conventional share trading anymore. The leveraged nature of the product and the ability to go short as easily as long are just two of the significant advantages that spread betting has over traditional share dealing. Spread betting allows you to profit from the change in price in the shares without having to own them. This has two obvious benefits — you don’t have to pay stamp duty for buying the shares, and because it’s betting you don’t pay capital gains tax on your profits. But the major benefit is that spread betting leverages or gears up your money. You don’t need anything near the cost of the shares in order to make the full profit of the change in price. Of course, leverage works both ways so your losses can mount up, and that’s why you need to approach spread betting as a business, doing your research and not treating it as a gamble. Blue chip shares in particular like FTSE stocks come with margins of just 10% (5% for the even more liquid) meaning that traders benefit from higher leverage, which opens traders up to the possibility of bigger gains or losses on their positions. Couple that with tighter dealing spreads and better liquidity and you start to understand why so many traders prefer dealing in FTSE 100 shares as it allows them to dip in and out of positions easily. On the other hand margins on certain small cap and AIM shares could be as much as 50% and sometimes even 100% due to the lack of liquidity and higher risk associated with dealing in such shares. Having said when I open a position on a share using spread bets if it is long I will normally use leverage prudently and will often cover myself down to 0p. I use spread betting mainly to avoid CGT. Obviously with a short the risk can be higher as there is no limit as to what the price can go to, but I have set aside money to fund my bets then a bit. Maybe sounds excessive, but I can sleep at night and not worry about getting stopped out on a spike up. Although all these benefits are present in the UK market, where spread betting has gained rapidly in popularity in recent years, the UK resident is able to spread bet on a wide range of shares from around the world. When spread betting shares, you can just as easily bet that the share price will go down (effectively going short) as that it will go up. Spread betting shares works the same way as spread betting on any other financial product – you make a bet either that the price of the share will go up or go down, then wait to see which way it goes. There are two prices quoted, and the difference between them is the spread. The lower price is for selling bets, or going short, and the upper price is for buying bets, going long. The spread gives the spread betting provider his profit for setting up business in the first place. Let’s assume that you decide to go long on BP’s share price at, say, 435 for £10 a point (a point = each 1p movement in the share price). If the BP’s stock rises, and the ‘bid’ price at which you close out the spreadbet is, say, 458p, you make a gain of 23 points (458-435) at £10 a point. That’s £230. For example, Next shares trade around 2040, or £20.40. 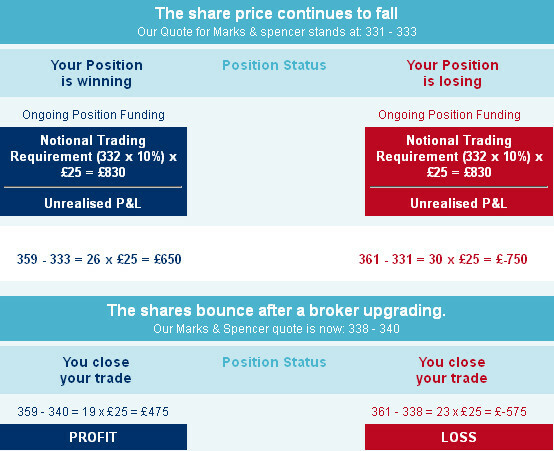 If you ask your spread betting provider for the price, you might get quoted 2038 — 2042, with a spread of 4 pence. The spread depends on the provider, and it will also vary between different shares and for other financial securities. In August 2010 Next announced that consumer spending would fall, and that they would raise prices in 2011, and both of these news items caused the share price to drop. If you had watched for this, using a trading strategy called trading the news, and sold or taken a short position on the shares, you could have made a good profit. Say you took a selling bet at 2038 for £10 per point, and the shares lost 8% (as they did) so the new quote was 1875 — 1879. To close the bet you would buy at 1879. That would mean a point drop of 2038-1879, or 159. So the £10 per point bet you placed would pay out a profit of £1590. No commission, as the provider’s fees are included in the spread. No capital gains tax, as it is considered betting. That is why spread betting shares is rapidly becoming more popular than share ownership. The above trades show both profit and loss making positions. Please note that this is for illustrative purposes only. Trades can result in losses, which mean you could incur additional liabilities far in excess of your initial margin deposit.